This is easy to use, easy to apply and quick drying (1-2 mins a coat). You need to make sure there is plenty of polish on the brush for good coverage. This is such a pretty colour and it has a very subtle shimmer. I sadly couldn't capture it, as it is very difficult to see. Lasted really well. Purchased from = either John Lewis or Debenhams - lol I can't recall! It's gorgeous and it looks great on you. But I also agree, the shimmer could have been a bit stronger. lovely color! 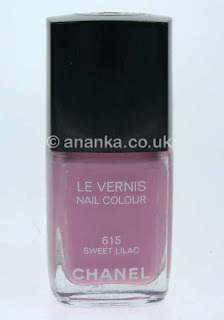 I have a lilac from Chanel but it is slightly cooler toned and I love it! I love the creamy finish, great color for spring. pretty! i've been really curious to try Chanel polish but couldn't justify the price... maybe one day ;) I just don't want to get addicted to buying them that would be bad!! !